Kidney disease is a serious health problem in dogs that require medical attention. Other common terms for kidney disease include renal failure, kidney failure, and renal insufficiency. As a dog owner, it will be helpful for you to understand the different forms of kidney disease and the signs that indicate kidney disease. When a dog's kidneys are not working properly, it can affect every other system in the body. The kidneys are vital organs in vertebrates, including dogs and humans. A dog's kidneys are located in the mid-abdomen near the back (very similar to the location of human kidneys). The kidneys are attached to an extensive network of blood vessels that connect to other vital organs. The kidneys are complicated organs that serve several purposes. They are responsible for maintaining a proper electrolyte and pH balance in the blood. Kidneys filter out waste from the blood and produce urine through which the waste is excreted. The kidneys also produce hormones and enzymes that help regulate various functions throughout the body. The heart and kidneys work together to keep the body in operation. Like humans, dogs cannot survive without any kidneys, but they can live with only one kidney. When the kidneys suddenly fail in an otherwise healthy dog, it is considered acute renal failure. This form of kidney disease develops over a few days, causing a dog to go from normal to very sick in that short period of time. Acute renal failure in dogs is most commonly caused by toxin exposure. Common culprits include antifreeze, poisonous plants, some over-the-counter human painkillers, and rat poison (the form containing the chemical cholecalciferol). Kidney infections are another potential cause of acute renal failure. Severe urinary tract infections may develop into kidney infections if left untreated (although this is not the only cause of kidney infections). Acute renal failure may also occur if there is decreased blood flow or oxygen delivery to the kidneys. Examples include trauma, severe dehydration, and heat stroke. Certain congenital or acquired health conditions may lead to acute renal failure. Sadly, many dogs with acute renal failure will not survive more than several days. However, if caught early enough and treated aggressively, some dogs can fully recover. Treatment generally involves intravenous fluid therapy and supportive medications. Veterinarians will also try to determine the underlying cause of the renal failure and treat accordingly. Chronic kidney disease is sometimes called chronic kidney failure. More vets have begun calling it chronic kidney disease because it seems to be a better way to describe the disease. CKD is the result of degenerative changes in the kidney that affect its ability to function properly. CKD is most common in aging dogs and tends to come on gradually. Kidney function becomes worse over time, eventually leading to death. There is no cure for chronic kidney disease in dogs. However, there are treatment options that can manage the disease, improving the dog's quality of life and extending survival time for up to several years. When dogs have an acute renal failure, these signs can worsen rapidly over a period of days. In the case of chronic kidney disease, signs gradually get worse over a period of months to years depending on the dog's response to treatment. It is important to know that chronic kidney disease signs typically do not appear until the disease has progressed to a certain point. This is why it is so important to bring your dog to the vet for routine exams and follow your vet's recommendations for routine lab work. Screening healthy dogs allow vets to detect small changes over the years. Kidney disease may be detected early through routine lab work and treatment can begin before your dog even gets sick. The results of these tests can usually give your vet enough information to diagnose kidney disease. When kidney disease is present, the BUN and creatinine will be elevated (these chemicals build up in the bloodstream when the kidneys are not able to filter the blood properly). Blood phosphorous levels may also be high. The urine is often dilute and may have excess protein (an indication that the body is losing protein because the kidneys cannot properly filter). Anemia might be noted on the CBC as this is sometimes caused by kidney disease. Once a diagnosis of kidney disease has been made, further tests may be warranted to determine how severe the kidney disease has progressed. Blood pressure measurement is an important test because hypertension is common in dogs with kidney failure. Your vet may also recommend abdominal radiographs (x-rays) and/or abdominal ultrasound. 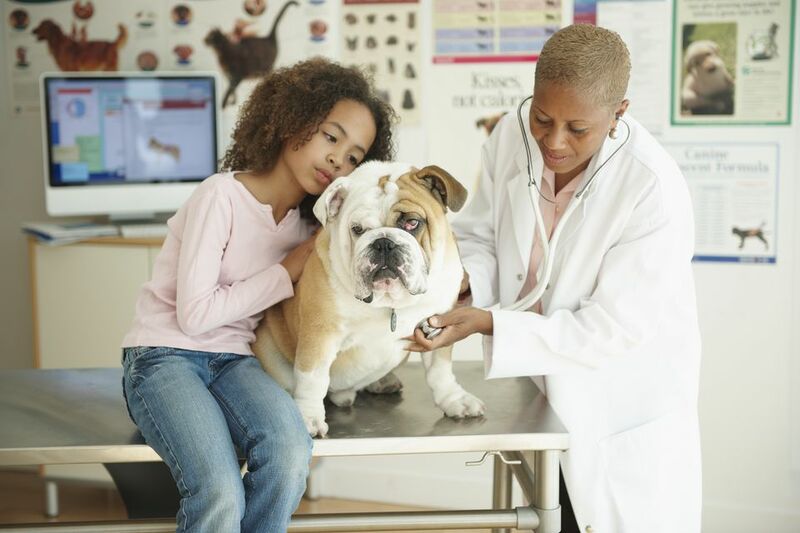 Once your vet has a complete picture of your dog's health, a treatment plan will be developed. Treatment depends on the severity of the disease and will change over the course of your dog's illness. Be aware that lab tests must be repeated often to measure the changes in the severity of the kidney disease. Dogs being treated for acute renal failure may need lab work one or more times per day. For dogs with chronic kidney failure, lab tests are usually repeated every few weeks to months (more or less depending on how the dog is doing). Treatments are adjusted according to the lab results. Fluid therapy is the cornerstone of kidney disease treatment. Intravenous (IV) fluid diuresis is necessary to treat acute renal failure. It may also be used when a chronic kidney is first diagnosed (depending on the lab results and condition of the dog). IV fluids are administered through an IV catheter at a high enough rate to flush the system of toxins. Care is taken to avoid a fluid rate high enough to negatively impact the dog's heart. Dogs with kidney disease may need to be on IV diuresis for several days, during which they must stay in the hospital. Dogs with chronic kidney disease are often maintained on subcutaneous fluids given by the owner at home. This involves placing a needle under the loose skin between the shoulder blades and infusing a set amount of fluid. This may need to be done daily or only a few times a week depending on your dog's stage of kidney disease. It may sound horrible to you now, but it is actually quite easy to give your dog "subQ" fluids at home. Your vet's office will show you how and provide all the supplies you need. Giving fluids to your dog will maintain hydration and can provide extra fluid to help support the kidneys. Therapeutic diets are often used to manage chronic kidney disease. It is believed that adjusting the levels of certain components in the diet can lower the burden on the kidneys. Therapeutic kidney diets are often low in protein, phosphorus, calcium, and sodium. Palatability is a common issue with these diets, but several commercial brands are available to try. Medications and supplements are used for a variety of reasons. Phosphate binders taken with food can decrease the amount of phosphorous the body absorbs, lessening the burden on the kidneys (which normally filter phosphorous out of the blood). Antacids are used to reduce the excess acid produced in the stomach (this occurs when the pH is not well-regulated by the kidneys). Antiemetics help relieve nausea and vomiting often caused by kidney disease, sometimes improving appetite. ACE inhibitors can control protein loss through the kidneys and help regulate blood pressure. Additional blood pressure medications may be necessary. Certain vitamins and supplements may be recommended based on your dog's needs and your vet's opinion. Dialysis is not commonly used due to its expense and scarcity. This treatment involves the use of a machine that filters the blood. Dialysis is generally only offered at certain large specialty hospitals. Dogs with acute renal failure may benefit most from dialysis if it is available. A kidney transplant is rare. This expensive, high-risk procedure is only performed by certain veterinary surgeons. Remember that acute renal failure cannot always be reversed, despite best efforts. Talk to your vet about the pros and cons of specific treatments. Ask for expected outcomes so you can be as prepared as possible. Know that your vet will do everything possible to save your dog, but treatment may not be successful. Although some dogs with chronic kidney disease can live for years with careful treatment, some will only live for a few months, even with the best treatment available. Keep in communication with your vet about your dog's signs at home. Be sure to go in for all recommended rechecks. Be flexible and positive, but also realistic. Most dogs eventually stop responding to treatment and become very sick. At this time, many owners choose humane euthanasia to end suffering.